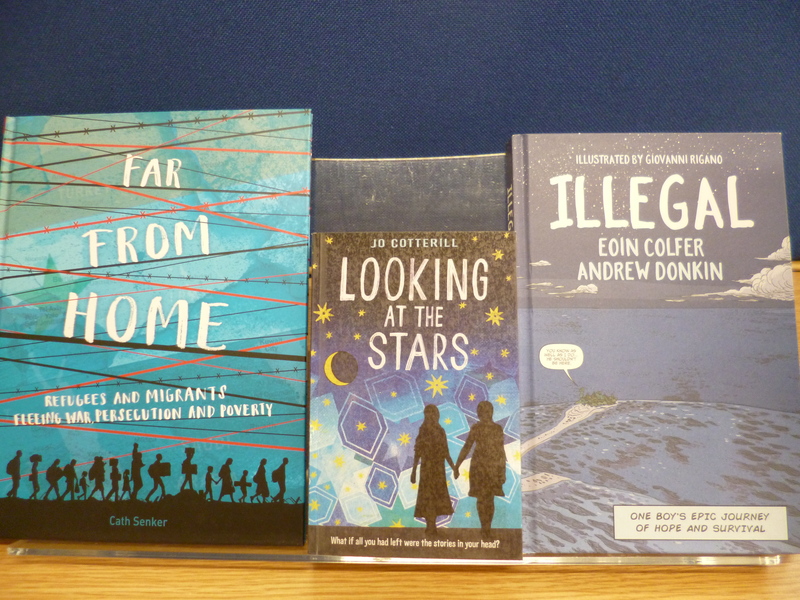 Refugees have at last arrived in our library… at least on paper. 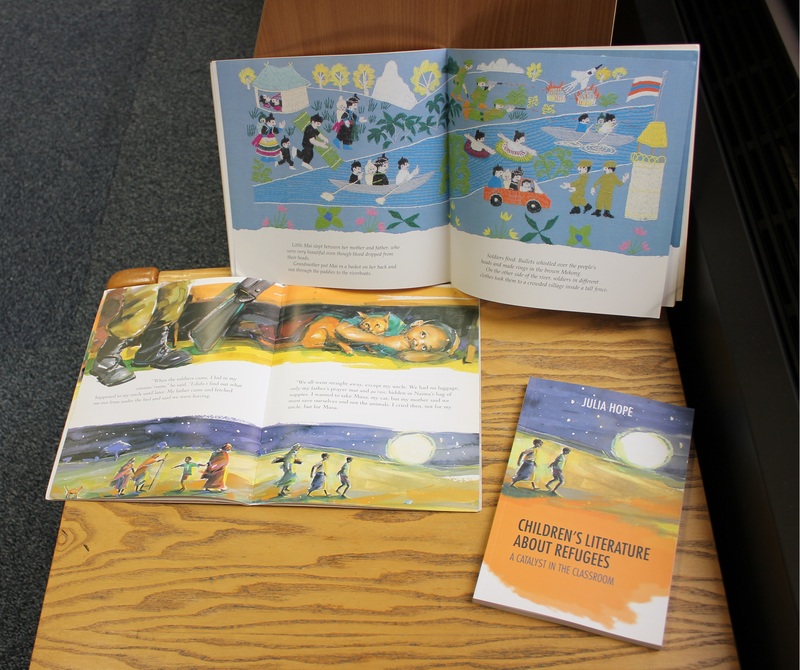 On this blog, we have already described a collection of books without words originally created for refugees, and we shall tell you more about resources for and about refugee children and other migrants. Here just a brief note on some marvellous Curriculum Resources which have recently reached the shelves of the Newsam Library at the UCL Institute of Education. On the side of fiction, we have some accounts of long, arduous, painful journeys – literal journeys of children across land and sea. The novel Looking at the stars by Jo Cotterill is set in an unnamed war zone in a fictitious country, but it is based on research which is summarised in an afterword. Two sisters survive hardship and bereavement through their mutual support and through storytelling – a nice touch in a story. 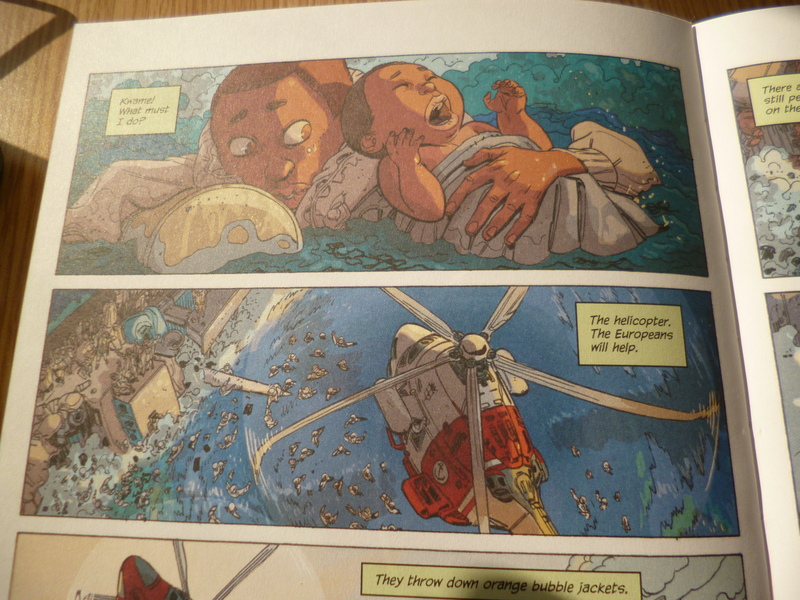 A different kind of storytelling is presented in the graphic novel Illegal. 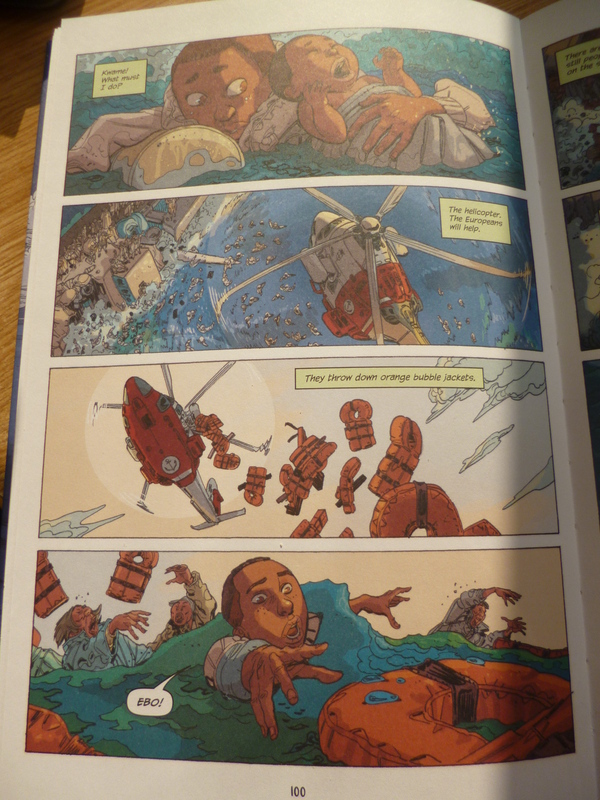 Giovanni Rigano’s beautiful illustrations of the story by Eoin Colfer and Andrew Donkin give you the viewpoint of the refugees quite literally: from the helicopter, you watch people as tiny dots floating in the heaving sea; then you are battered by the waves; you look up to the life-jackets thrown down to you; then you are up in the air, only to witness others go under… The title of the book is inspired by Elie Wiesel’s maxim that no human being is ever ‘illegal’. To match the fiction (novels, graphic novels, and picture books), the IOE library also provides you with non-fiction and textbooks. The dedicated resource Far from home gives you plenty of facts about refugees and a number of brief ‘case studies’ which often run against prevailing narratives. On the one hand, the book states that the vast majority of refugees want to return to their home country when circumstances allow it; on the other hand, it shows people who have settled down ‘far from home’ and are contributing to society. I like the photo of the Syrian pianist who enjoys fame in Germany and of the two women doctors in headscarves! A current citizenship textbook for the new GCSE (9-1) by Steve Johnson and Graeme Roffe contains long sections about human rights, migration and asylum, and international relations. You can find more teaching resources for citizenship at 323.6. Material about human rights is shelved at 323; migrants are filed at 304.8 and refugees at 362.87. To get children or adults with limited language skills to read or to talk, or perhaps to act or to draw, a graphic novel or a story without words might just be the right start. Look for ‘Stories without words’ and ‘comic books’ on the UCL catalogue. Ask a librarian, and they will advise you on materials for English as a foreign language, including some that you can photocopy or download. And do enjoy our books yourself, those without any words, those of only words, and those with text and pictures. This entry was posted in Curriculum Resources and tagged citizenship education, graphic novels, refugee education, refugees, stories without words. Bookmark the permalink.